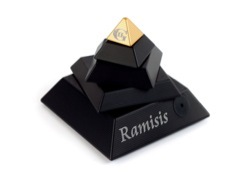 - now in 2009 we proudly present the Ramisis Puzzle. The Ramisis is the second exciting puzzle in the Isis Puzzle & Adventure series! A totally complete new gaming concept. Riddles and clues must be solved to find real pyramids and virtual pyramids around the globe, using the player?s unique Isis key to unlock thousands of pounds in gold and silver coins that are waiting to be discovered. The ISIS 1 and the Ramisis come in a stunning leather giftbox ! A USA & UK forum and a forum in Dutch, French and German.